Moderator Mark Johnson speaks at a forum Monday night with five candidates for governor. 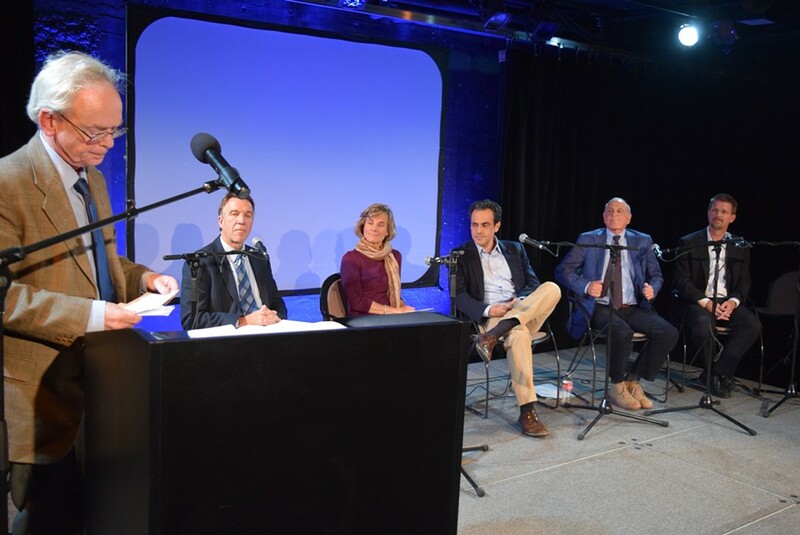 From left: Republican Phil Scott, Democrat Sue Minter, Democrat Matt Dunne, Republican Bruce Lisman and Democrat Shap Smith. Should the state’s new school-consolidation law be repealed, revised or lauded? All those views emerged as the issue gained attention in the fledgling 2016 governor’s race. Monday night, as the five candidates for governor met for a forum otherwise focused on entrepreneurial issues, they were asked if they consider the new law, Act 46, a success or a failure. Students in Morrisville have fewer course choices than their neighbors in Stowe, he noted. He added that if the two districts merge, then a Morrisville student could take the Chinese class Stowe offers. His defense came after fellow candidates peppered the law with criticism. Most dismissive was Republican Bruce Lisman, who called the law “generally a bad piece of legislation” with “unfair” spending caps. “I favor repealing it,” Lisman said. Lisman contended voters won't get the property tax relief they sought. “They asked for change and got a bill that hurts them, ” Lisman said at Monday night's forum. Tuesday morning, Lisman amplified his message, sending out a news release criticizing fellow Republican Phil Scott’s stance on Act 46 as too weak. He suggested Scott's view will change as Scott hears from the public. “I believe Lt. Gov. Scott (sic) view of Act 46 will continue to evolve toward repeal as he observes the negative reaction by the public to this hastily crafted law,” Lisman said in the release. During an interview on Tuesday, Scott said that the legislature should act next year to clarify confusion the new law has generated about school choice, specifically whether districts that pay tuition to send children to other schools can retain that practice if they merge with districts that operate their own schools. “We need to make abundantly clear what the law says, and if it needs to be changed, we should change it,” Scott said. Scott said his inclination is toward expanding school choice, rather than limiting it. Lisman also accused Scott of making conflicting statements within a 10-day period about his views on Act 46, but in is his haste to heap criticism on Scott, Lisman stumbled. Scott's statement had actually come a full year and 10 days apart. Lisman's campaign manager, Shawn Shouldice, acknowledged she had misread the year on an article that referred to an idea Scott touted during his 2014 campaign for lieutenant governor. Scott suggested the creation of a statewide board to draw lines for new, larger school districts. The board would be similar to the Green Mountain Care Board, which oversees hospital budgets. “I brought that up as an idea to start the conversation,” Scott said Tuesday, but he acknowledged it was unpopular with many, who worried such a board would erode local control. Scott said he is no longer pursuing the idea. As Lisman calls for repeal of Act 46, Shouldice acknowledged the governor wouldn't have the power to do so. She said Lisman anticipates the public will make it clear to legislators by next year that they should repeal school law. Lisman didn’t offer any alternative plans at Monday’s forum, but Shouldice said he will outline them soon. His ideas will include regionalization of school districts, akin to what his former policy organization, Campaign for Vermont, has advocated and lawmakers rejected. The two other Democratic candidates also said Monday night that the law needs changes, but should not be repealed. Democrat Sue Minter said she also opposes the uneven spending caps, wants clarity about school choice and considers the timeline requiring districts to have merger plans by 2019 to be too rapid.